- available in 9 awesome Colors !!! Crazy STAR Jam Plugs: Don't use your Toe Stops? Remove them and screw in our Star plug! Our Crazy ZOOM wheel features a low profile, race quality urethane on an oversized custom hub. The hub to tyre ratio of this wheel gives you a super lightweight wheel for greater acceleration, and a stiffer overall wheel for greater response. The ZOOM wheel is perfectly suited to Speed, Jam, Rhythm and Derby skating - and comes in 9 awesome colors to match your personal style. 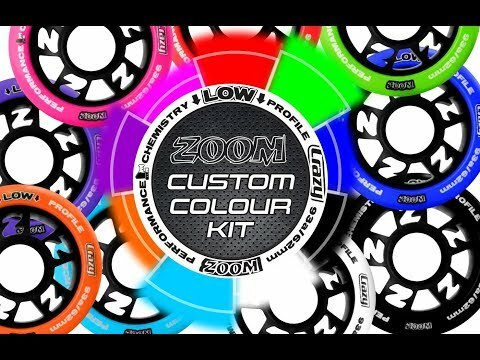 As part of the ZOOM Custom Color Kit - you get a full set of 8 Zoom Wheels, matching laces and matching Star Jam Plugs. This set is a one stop shop to fully customize your skate setup at a never before seen price! GO CUSTOM.